One of the things we try to do here at Junior Towne is to keep updated on news throughout the juvenile product world by attending conferences, networking with fellow baby store owners and belonging to the Baby News Group. This week there was a massive crib recall of dropside cribs made by Storkcraft and sold at various big box stores. The best review of this, the where, and why that we have found is written on the Baby News website (www.babynews.com) by Richard Goore, owner of Goore’s Babies to Teens in Sacramento, president of the ABC Juvenile organization, a fellow Baby News member and an all around great guy. He gives an industry insider perspective on the recall and his blog is well worth the read. Please note that the Pali dropside cribs that we sold for many years but were discontinued several years ago have interior hardware and do not have the problems that they have found with other dropside cribs. In addition, because of the additional wood used in Pali cribs, they have superior slate strength. The importance of following instructions and using juvenile equipment properly cannot be stressed enough. We have much to be grateful for this Thanksgiving-warm and secure homes, loving families and of course, you, our extended family of customers. One of the best Thanksgiving sites that I have seen is the History Channel’s (www.history.com/content/thanksgiving/the-first-thanksgiving.) “Mayflower myths” and “The First Thanksgiving” make for a great read and would be fun to share. “Seventeenth Century Table Manners” my boys will enjoy repeating. At any rate, we are grateful for our many blessings. Happy Thanksgiving! PS-Don’t forget to check out our special Christmas Sale racks on Black Friday. We open at 10 AM. Thursday- Patagonia and selected mittens and gloves are 50% off. See you for the sale! *limited to stock on floor, not applicable with other discounts or coupons. …really know what it takes for an Alaskan winter. The new “sac igloo” by 7 A.M., a Montreal firm, is customized with the finest protection from wind and rain. 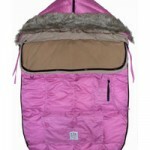 It has a soft, cotton liner and a fluffy, warm insulation similar to down. These bundlers have five-point harness back openings and will fit in carseats and strollers, giving parents the freedom to enjoy their favorite activities during the winter months. We particularly like the faux fur button off ruff around the hood. Le Sack is the best we have seen in the “keeping baby warm” market. Michelle Williams below is probably overdressing her baby if she is using this in the summer (note the leaves on the trees.) But then who are we to question a celebrity? 11/9-What Are Kids So Stressed About? Take a look-I think that you will find these interesting. WSJ/juggle is the site. As we close our doors and shut our windows to keep out the winter cold we need to ask ourselves if we have done everything possible to create a toxin free environment for our children. Of late, we have become very aware of the countless household items, such as food containers, flooring and paints that contain toxic chemicals. Several of the products that we carry here at Junior Towne go above and beyond the usual compliance testing and are certified to be toxin free. Under the Nile organic cotton clothing is certified to the Global Organic Textiles Standard, meeting requirements for documentation, limits on chemical use and processing, and social responsibility standards. This company makes organic diapers, infant wear and a variety of cotton play sets. We feel proud to have been selected as one of their vendors plus the texture and durability of their products is beyond compare. Under the Nile products are made from Egyptian cotton in a way that reflects both a care of the environment and care for others. Mattresses and Bedding from Naturepedic- These mattresses and bedding are Greenguard certified. All Naturepedic products are rigorously tested by Greenguard, an independent third-party organization on a regular basis. To learn more about Greenguard go to www. greenguard.org. We found that the tips for good indoor air quality to be especially helpful. In addition, Naturepedic products feature U.S. grown organic cotton and are made, tested and certified in the USA. We carry only the waterproof mattresses (makes sense, doesn’t it?) and mattress pads providing non-toxic fire protection and food grade waterproofing. These may run a little more but can you put a price on peace of mind? We always say that the extra cost of a product is more than off set by one trip to the doctor’s office. Children can face long term health risks due to indoor air pollution resulting from the myriad of everyday products in our homes. Allergies and asthma is on the rise in children. Can we do something about this? You are currently browsing the Junior Towne Blog weblog archives for November, 2009.